Today, I decided to be adventurous because I, in fact, sometimes do have a sense of adventure. Or perhaps what sparked my sense of adventure was something that I received in the mail (but I think that deserves a separate blog post regarding such things) and it piqued my interest. Had to go investigate. Without getting into details…I experienced something today that made me appreciate what I do have. But ultimately, it made think about what my Christian faith is rooted in. The cool thing about trees is that their roots really take hold of the ground where they stand. The place where we can really learn more about Scripture and let our faith take hold is in church. I like to think that my Christian faith is rooted like a tree, for was it not a tree that Jesus was crucified on? 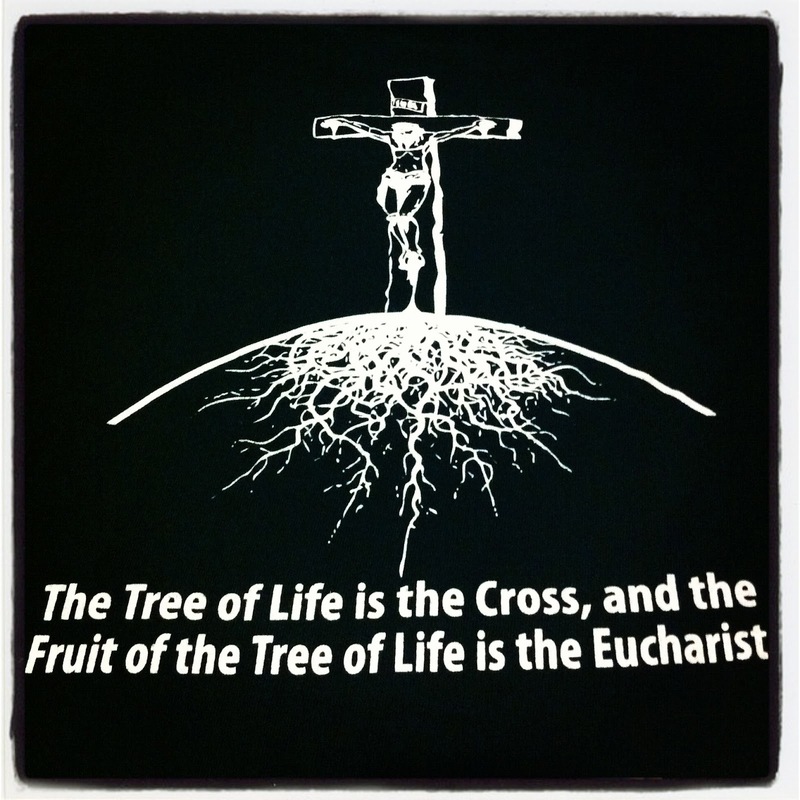 With that said, like a tree, my Christian faith should be rooted in Christ. I mean, that’s fair to say. I can’t rightly call myself Christian unless my life and faith are rooted in Christ, right? And perhaps out of the hardness of my heart and mind, I can’t learn how to root myself in Christ…alone. I need a place to learn more about Christ in community with others and where else would you do that besides church? So, a Christian church should ultimately lead the congregation to Christ. Logically, every thing that happens at church on Sunday should lead towards Christ. And that’s fine. But I begin to wonder and reflect on if such things that happen in church on Sunday is what I’m focused on rather than being focused solely on Christ. In other words, does every action within the context of church on Sunday help me focus on Christ so that my faith may take root in Him? After experiencing today and reflecting on my entire faith journey in general, I’ve come up with a few things that I know that my Christian faith ought not to be rooted in. Sheep are cool animals but they’re not exactly convicted enough to lead themselves to where they need to go. They need a leader. A shepherd, if you will. A shepherd herds the sheep and leads them where they need to go. Likewise, you can’t have a church of “lost sheep” unless you have someone visible leading the way. Hence, the need for a pastor. Cool. Obviously, the pastor’s job is to shepherd his flock to Christ. But imagine if I let my Christian faith be rooted in the pastor? Like, what if he has freakin’ amazing sermons that make me think, make he laugh, make me cry, make me want to go out and do something? Like, I love what he has to say! And maybe perhaps though ministry, I’ve developed a pastoral relationship with the pastor because he’s helped me through the worst of times and best of times? Or perhaps my pastor has done great things for my church community and I’m grateful for him and I keep coming back to support him? Okay, that’s all fine. But, what if he passes away? What if, because he’s human, falls away from his Christian faith? Is my faith dependent on the pastor? Do I remember Who he’s supposed to lead me to? Hmm. I love music. I’m a band nerd at heart. People often ask me “Hey JD, what’s your favorite music?” and to that I say to them, “…anything that sounds good to my ear!” You know, I even played my clarinet at church! Not gonna lie, I do have my favorite songs and hymns. And there have been times where I’ve gone to church and the choir sang quite phenomenally! To the point where I feel like applauding them! I like it a lot at church when the music is great, because it’s disappointing when the music isn’t that great. >_> And praise and worship songs are awesome. So are normal hymns. St. Augustine once said, “When you sing, you pray twice.” and I love it when the music in church on Sunday is done so well, I feel like I’m praying seven times seventy-seven times. All this is fine and well. But … what if some of the members of the band or choir is sick that day? What if instruments break? What if the sound system is screwing up? Is my faith dependent on the music played in church on Sunday? Do I remember to Who we are singing to whenever there is music at church? Hmm. Lastly, if I am to go to the house of the Lord, I wouldn’t want there to be any doubt that this is, in fact, a house of worship for the greater glory of Christ. I think back to the time period of Exodus whenever the Lord commanded Moses and Aaron to go through an elaborate set up just so the Ark of the Covenant has somewhere holy to reside. Every tribe in Israel knew because it was obvious to them that this place is a holy place. Not only that, but the entire Israelite encampment focused on the place where the Ark of the Covenant for it was the center of their camp. I think it’s fair to say that our Christian churches should reflect that focus as well. A Christian church is a house of worship! But not just that–it is a house of the Lord! Is Jesus present at my church on Sunday, and if so…what is my response? Perhaps I’ll donate some money to the church so that the pastor can make improvements to make worship easier. How so? Let’s make the seats comfortable. Let’s employ modern technologies regarding sound and light to make it easier. Slideshows to show hymn/song lyrics? Yes! Perhaps let’s just make everything about the Sunday experience as comfortable as possible or make it look cool! But does my faith depend on how comfortable I am at church on Sunday? Is my faith dependent on how nice the church looks? Do I remember Who resides in this house? Hmm. Shortly touching on this…what if the pastor is terrible? What if the music was absolutely abhorrent or maybe no music at all? What if the church was a shack or horribly dilapidated with nothing? Do I remember Who all this is for? Hmm. So, the pastor, the music, and the church…no matter how awesome (or not awesome) those are…are they what brings me to church on Sunday? Have I let my faith take root in the pastor, in the music, in the church (building)? I should take a hard look at why I go to church on Sunday. Who do I worship? Who is the pastor talking about? Who am I singing to? Who does the church point towards? Obviously, it should be Jesus Christ. He doesn’t fade away. He’s always awesome. He should be the reason why I’m at church on Sunday–not because I’m obligated to, but because I have a genuine desire to deepen my relationship with Him. He alone should be the reason why I’m at church on Sunday–not because church makes me feel good in any fashion. Jesus, who was crucified on the tree, is what my Christian faith should be rooted in, for from it springs forth the fruits of eternal life. Every time I go to church, I should always reflect on why I’m there. I shouldn’t forget Who my focus should be on. I should take into consideration everything about my experience at church on Sunday and if that experience is focused on Jesus. And maybe that’s why I’m Catholic. Because as the Bread of Life Discourse in John 6 describes, we know that Jesus is being literal when He says He is the Bread of Life and whoever eats of this Bread will have eternal life. And only in a Catholic Mass (or other non-Latin Catholic churches in union with Rome) will you find the Eucharist, which is Jesus truly present: body, blood, soul, and divinity. So if a Catholic church truly houses Jesus, you would expect the decor and architecture to give you a sense of “this is, in fact, a holy place.” In a Catholic church, since Jesus is truly present, we know that He didn’t magically appear in a tabernacle. No, it’s because the priest, serving in the person of Christ and given the authority to do so by Jesus Himself through the apostles and laying of hands, who gives us the Eucharist–Jesus, literally. In a Catholic Mass, the music, when done right, doesn’t draw attention to the choir, but rather, draws your attention to Jesus. Sometimes the music is done in Latin! Or chanted! Or perhaps there’s not even any music at all! I love going to Daily Mass and Adoration when I’m able to. See, I get the vibe that the people that show up to Sunday Mass are there because they’re obligated to go. At Daily Mass, no one is there because they’re obligated to go–they are there because they want to be there. I think having the desire to go to Daily Mass affirms what my Catholic faith is rooted in–Jesus. In the Eucharist. Priests don’t typically have elaborate homilies for Daily Mass. The choir may or may not be in full force, if at all, for a Daily Mass. But, Jesus is there. And for Adoration? That’s where I can just take the time to adore Jesus in the Eucharist. More often than not, Adoration is spent in silence. Just me and Him. Here is the source and summit of my Christian faith–the Eucharist. Essentially…it doesn’t matter how I feel…how comfortable I am…my faith is rooted in Jesus in the Eucharist because He’s truly present. And so, flowing from that, my experience at church on Sunday and every day should lead my faith to take root in Jesus Himself. Deep stuff, if you think about it. I’m going to go to Daily Mass at least twice this week and hopefully Adoration after work on Thursday. Challenge accepted.